Observer’s 18 for 2018: the talent and trends tipped for the top. Elle’s 12 addictive books you have to read to get through in 2018. Metro’s best new books you have to get through in 2018. BBC’s hotly anticipated debut authors for 2018. Black women today are facing uniquely challenging experiences in all aspects of their lives. Yet when best friends Yomi Adegoke and Elizabeth Uviebinené searched for a book that addressed these challenges they realised none existed. So Slay in Your Lane - the love child of exasperation and optimism - was born. From education, to work, to dating, to representation, money and health, this inspirational, honest and provocative Black Girl Bible explores the ways in which being black and female affects each of these areas - and offers advice and encouragement on how to navigate them. 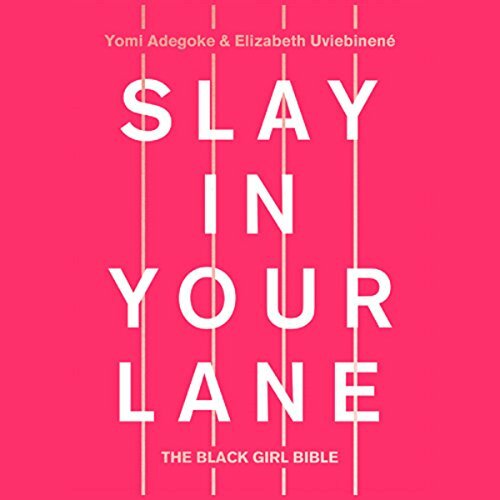 Illustrated with stories from Elizabeth and Yomi’s own lives, and from interviews with dozens of the most successful black women in Britain - including Amma Asante, Charlene White, Jamelia, Denise Lewis, Malorie Blackman and Dawn Butler MP - Slay in Your Lane recognises and celebrates the strides black women have already made whilst providing practical advice and inspiration for those who want to do the same and forge a better, visible future. And exceptional book tackling old the most important topics of a black woman’s life. Thank you slate in your lane I am not alone in my journey towards glory I think every black woman should read this book.